Back in September of last year, Starbucks made it possible to pay for your daily caffeine hit with their Starbucks Card Mobile iPhone app. The entire concept is pretty simple: punch in your Starbucks Card info, verify some details, and BAM! 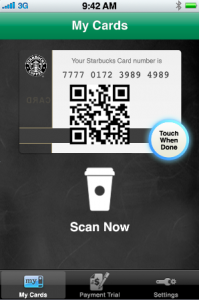 The iPhone app becomes the gift card, presenting a secure QR code for the Barista to scan when it comes time to pay up. Here’s the catch: out of Starbucks’ roughly 74 billion locations, only a few have started accepting the mobile payment system. As in very few. As in sixteen. Until today!